In the process of going through my V50 for my daughter I discovered that the original Lego-type switch has passed its use-by date. I have bought another switch which has everything I want i.e. Lights On-Off, Hi/Low beam, horn and turn signals but it has far fewer wires (8) in comparison to the original (13). Can any of you wiring gurus advise how to connect the two to get everything working, please? 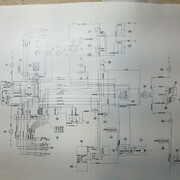 Thanks to Greg Bender for the V50 wiring diagram. What brand of switch is the new one? Photo? Its one I bought from Ali Express. The bottom carries the legend "domino Made in Italy. I think the yellow wire goes to the light master switch and it then jumpers internally to the H/L red button, check that with your meter. 2 No connection this is between the headlight On/Off old dimmer switch, it doesn't go anywhere. What does the new switch block do for earths? back through the handlebar? I'll Have a further look when I get a chance. We may need more info or you need to bell out the new switch on the original switch gear the power for the overtaking lights and headlights is routed separately on the new switch this doesn't appear to be the case. 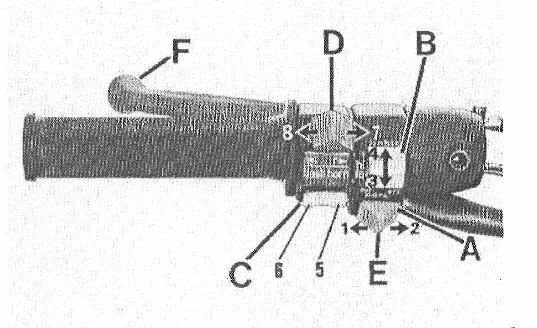 Upon further examination, the horn and it appears the flash overtaking is earth switched meaning the switch completes the earth circuit on the original switch gear pin 3 is dedicated to this earth, there appears to be no dedicated pin on the new switch gear although its possible it relies on a contact to the handle bar for this purpose. The headlights on the original switch gear however appear to be power switched meaning you would need a 12volt feed in and a wire out to go to the relevant circuit not sure if the new switch gear uses the power in for flash for this purpose. The new switch gear may assume (quiet sensibly) that for high current circuits it is switching relays rather than direct power which appears to be the case from the diagram, the number key might be nice. It looks like relay 24 is for the flash circuit but doesn't run the headlights and there is no headlight relay, sense it makes none, however Italian electrics have a reputation for a reason. 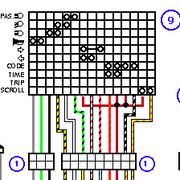 Now it is entirely possible I'm missing a joint in the diagram. Might be time to sit down and write out a few diagrams and work out whats what where, actual electrical work is typically pretty quick and easy, its the figuring it out that takes the time, the opposite to mechanics IMO. I recommend you BUY ANOTHER SWITCH. 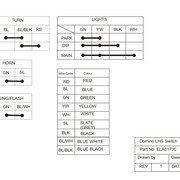 The reason is that the horn and turn signal positions are reversed from the usual positions on these switches. If you install yours you will doom yourself to a lifetime of blowing the horn when you want to cancel the turn signals, and canceling the turn signals when you want to blow the horn. 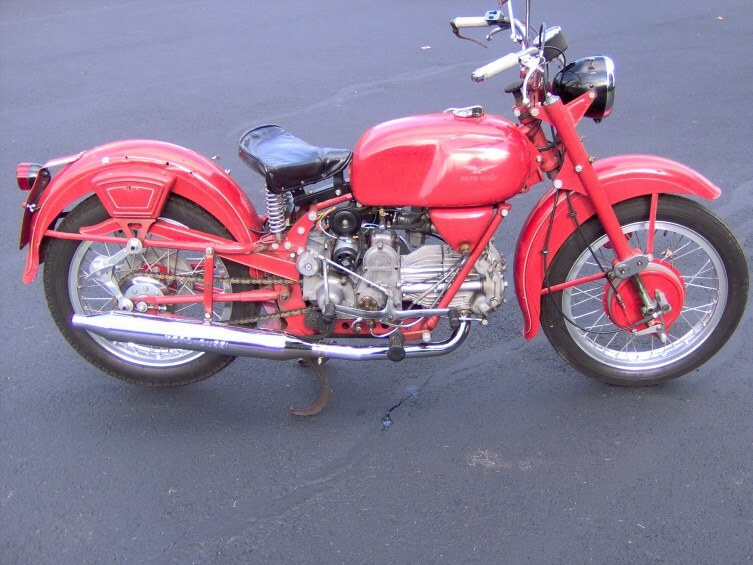 This has been a constant source of complaints from Griso owners ever since the bike was introduced. I consider it to be pretty dangerous, and started to install another switch, though I haven't completed the project yet. If you decide to buy this one, I can provide information on its internal wiring, which I had to determine by testing. It seems to be a well-made switch. I repeat, BACK AWAY FROM THE SWITCH. Taking note of what Moto says, it could be an issue, I just adapted to my Griso, it didn't take long. I never even realized they were backwards from normal, I had an Eldorado, VII Sport, a Lario and California II at the time. I had to remember the gearshift was 1 Down 4 Up instead of 1 Up and 4 down as well, no big deal. Yes, I could be less adaptable than some. I do have other bikes I ride that have the buttons in the right places. Once you digest the format, this diagram is an excellent statement of the functionality. I recommend starting with a similar grid and filling it in for the switch you've got. But I really recommend getting another switch for the sake of your daughter. I wondered about the ground for the horn and Headlight flash as well, I think its the Green wire and can be used as either ground or +12 Volts depending on how the bike is wired, it would be easy to check with a multimeter to the Blue/White or Grey wires with the appropriate button pushed. I'm with Moto on this one. I *hate* having a non standard switch. I use the horn maybe twice a year, but when I do, I want it to be the HORN, not the turnsignal.. what were they thinking? That's possible however what is the scheme for the headlight on the new switch vs the original V50 wiring, does it expect power from the same wire? I thought the headlight feed was the yellow wire, I think it feeds the light switch, from the other side of switch to the common of the H/L selector. Easy to tell with an Ohmmeter on Black & White, does it connect to Yellow with the switch On? All this talk about switch compatibility, What was the original V50? The only thing the young Lady will notice is how nice it is to use after this. When the two tiny strands of copper in the original left-side switch on my V50 II gave up the ghost I replaced it with the one in Moto's illustration. More copper, more electrons, brighter headlight! (also did headlight relay and H4 conversion, now I can see where I'm going). It wasn't plug and play, but wasn't too bad. Taillight is on all the time now, though. Not necessarily bad. 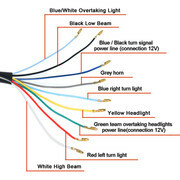 Connectors are standard Molex, readily available from any good electronics store or online. When the starter switch on my Monza (V50 III) died for the same reason, I replaced it with the Domino/Tomaselli one. And used that as an excuse to upgrade to a Tomaselli quarter-turn throttle. A little fiddling with cables but much better than stock. 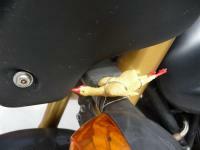 Or you can just cut the switch part of the unit and use the stock throttle assembly (cheap Guzzi content). HOWEVER that's a V50 III. Not plug and play on a II. There are lots of little and not so little differences between the two. V50II switch is flakey but still in use as I didn't quite figure out the proper wiring for the Domino one. Thank you for all your interest. I had already worked out some of the connections and took Kiwi Roy's guide to work out the rest. Everything went well until I connected terminal 1 to Yellow. Everything was fine until I switched on the key and the plastic on the yellow wire melted. Hmmmmmmm, back to the drawing board. After all that I found a diagram on the Gutsibits website which tells me all I need to know. If I can work out how to put up a PDF on here I will post it. 15 amp and yes, red/white. According to the new diagram green on the new switch is the common feed to the horn, flasher and headlight. Yellow is the park light. New Diagram? post No 1said Headlight. Please Ohm it out and find what other wires it connects to in the different switch positions. Does the switch make ground contact with the bars? It would appear that the switch has melted internally as the headlight switch no longer works. I cannot say if it earths through the bars but I will pull it apart and have a look. Are you sure the fuse didn't pop. it should have before any damage was done otherwise it's not doing its job. Please post the new diagram. The fuse definitely did not pop. As suspected part of the switch has melted. I already have a new one coming. Yes, it appears I told you to put the green wire in the wrong place. The new diagram shows it clearly. I suggest replacing the fuses with 5 Amp while you check it out, they will have less capacity to do any further damage. I think the 5 amp fuse suggestion is a good one, which I will do for testing. The switch has no earth through the bars. Given that you need new switch in any case, you could use this reproduction V50 switch from MG Cycle. It should have the same functions and same wire format as the original - might be plug-and -play. It would also be period-correct. I have the original OE switch on my V50II and it works very well, once you get accustomed to the rather unusual layout of buttons and functions compared to modern switchgear. 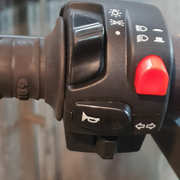 One useful function on the V50 OE or Repro switch no longer available on modern switches is the headlight shutoff position: the bike can be started with headlight off, using full battery power. 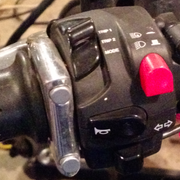 In any event using a V50 repro switch would be significantly simpler than adapting a modern switch with a totally different wiring scheme to your bike's OE electrical system. 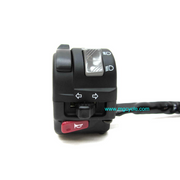 The K&S 12-0030 switch has a headlight on/off switch. I've put them on a V65 (same wiring cross as detailed here: http://thisoldtractor.com/moto_guzzi_tonti_handlebar_switch_-_k_s_12-0030_fitment_to_a_moto_guzzi_california_ii.html) and numerous Tonti and Loops.